News - Kanye West working with Justin Bieber on comeback? Kanye West working with Justin Bieber on comeback? The 'Sorry' hitmaker revealed last September that the pair had written songs together and that he wasn't sure if they would see light of day. 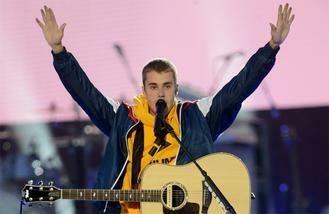 However, they are likely to book in further studio time later this year, when the 23-year-old pop superstar finishes his 'Purpose World Tour' in September, the Daily Star newspaper reports. When Justin was asked whether he will ever release any of the other songs he wrote with the rapper, he previously teased: "I don't know...maybe ...hope so." Kanye shared his appreciation for Justin when he said his hit 'What Do You Mean?' was his "favourite song of 2015". It would be only fitting that the 40-year-old hip-hop icon should work with Justin as he's always given him advice throughout his career. Speaking previously, Justin said: "Out of anyone in the industry who is creative, he really gets me. "His advice is always just, 'Make music that's so good people can't hate on it.'" Justin was only too pleased that the 'All Day' hitmaker wanted to listen to the songs he'd written. He said: "I didn't wanna bore him or waste his time. So I was like, 'Can I play you these songs?' and he was like, 'I wanna hear everything.' To hear him say that, it just showed that he cared." Kanye previously worked with Justin and legendary producer Rick Rubin on his record 'Purpose'. The father-of-two - who has four-year-old daughter North and 18-month-old son Saint with wife Kim Kardashian West - cancelled the remaining dates for his 'Saint Pablo Tour' last year, and was swiftly hospitalised for sleep deprivation and mental exhaustion. However, he is eager to reschedule his dates and put on a show everyone will be desperate to see. A source said recently: "Kanye wants to finish the tour. He loves his show. He wants everyone in the world to see it."